New York Times’ Screen Test – Alber Elbaz for Lanvin. Thank goodness for Lanvin for the world would be filled with mere trends and no innovation. This weekend while picking up a couple of extra T-shirts, tubes of travel-size toothpaste and other last-minute necessities for my trip to Milan and Paris for the fashion shows, it occurred to me that what I really need is a pair of good, comfortable flat shoes. I wasn’t so excited about the ballerina flats I found, and I wanted something that would look cute with dresses, skirts and pants. Last week, while leaving the Calvin Klein show, I met a showroom assistant on the street who was wearing a pair of Minnetonka fringed lace-up ankle boots. (She had folded over the tops and done some fancy styling with the laces.) Perfect! This season there are similar (dare I say Minnetonka-inspired) shoes from Giuseppe Zanotti and Jimmy Choo, but naturally these come with designer price tags. 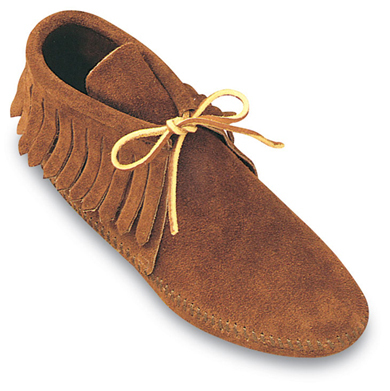 The Minnetonkas are only $32.95, so I might even get them in both black and brown. Street style: Karla M. Martinez (left) discovers a stranger with comfortable footwear — modified Minnetonkas.